We are kicking-off our 2019 Annual Fundraiser and we need your help! 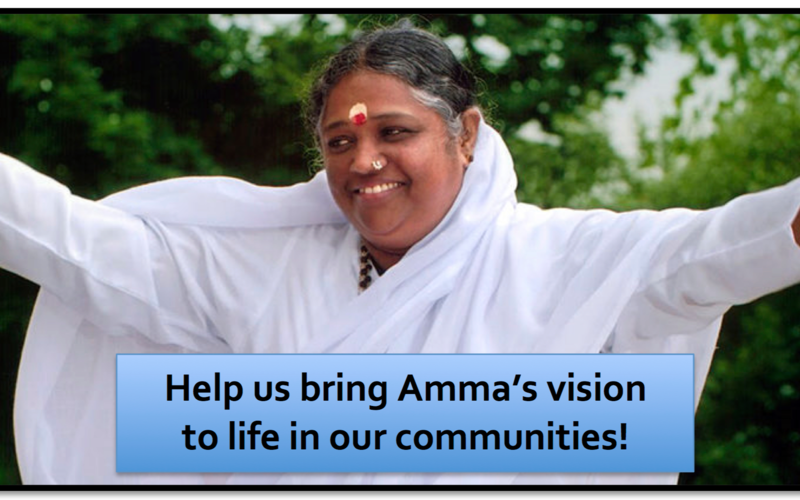 Amma has dedicated her life to alleviating the pain of the poor and those suffering physically and emotionally. Inspired by Her, Amma Canada, a 100% volunteer-run Registered Canadian Charity, has been serving the communities across Canada since 2003. - We contributed $100,000+ to social outreach initiatives. - $35,000 in educational bursaries since 2012 with Peel Children’s Aid Foundation for disadvantaged youth to attend college or university. - $15,000-$20,000 in donations since 2010, of food, clothing and gifts during the Christmas season, for families in need across Canada. - $15,000-$20,000 in donations since 2017 through St. Felix Centre to feed homeless men and women in downtown Toronto. - $120,000 in donations since 2016, to Welcome Hall Mission in Montreal, for assisting young mothers and women living on the streets. - $80,000 in bursaries since 2015 for women in Haiti to pursue higher education in Computer Science and Engineering with Foundation QHASUQ (Quebec-Haiti pour uno Scolarization Universelle du Quebec). Note: If donating more than $25, tax receipts can be issued for Canadians. Please send your donation receipt along with your address to info@ammacanada.ca. Visit www.ammacanada.ca... for more information.